Buttercup Squash are part of the Turban squash family (hard shells with turban-like shapes) and are a popular variety of winter squash. This squash has a dark-green skin, sometimes accented with lighter green streaks. It has a sweet and creamy orange flesh. This squash is much sweeter than other winter varieties. Buttercup Squash can be baked, mashed, pureed, steamed, simmered, or stuffed and can replace Sweet Potatoes in most recipes. Cut winter squash (any type) in half lengthwise and remove seeds. Place squash, cut side down, in a shallow pan on aluminum foil lined baking sheet. Bake at 350 degrees F. until squash is soft, approximately 45 to 60 minutes (depending on the size of your squash). Remove from oven and let cool. When cool, scoop out the cooked flesh/pulp (discarding the shell), place the pulp in a food processor and process until smooth. Measure out the amount you need for your recipe, and reserve any remaining pulp (either in the refrigerator or freeze) for other uses. Mix first 4 ingredients and beat well, then add sifted ingredients, add squash, fold in chopped nuts (save a few and grind into a fine dust for garnish). Pour into greased tube or bundt pan and bake 60 minutes or until done. 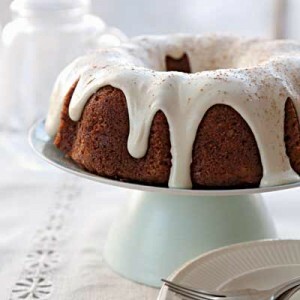 Let cool completely then top with cream cheese frosting and pecan dust. Either spread on with a blunt knife or spatula.